Earn up to 184 reward points. Eric Clapton has been a rock god for half a century. From busking on street corners and in local pubs to the raw blues of the Yardbirds, the rock/blues fusion of Cream, the guitar brilliance of Derek and the Dominoes, and the unforgettable songs of his solo career, he has proven his incomparable talent in the music world. His enduring presence has made him the subject of countless books, articles, reviews, websites, and gossip. Is there really anything new to learn about the man they call Slowhand? 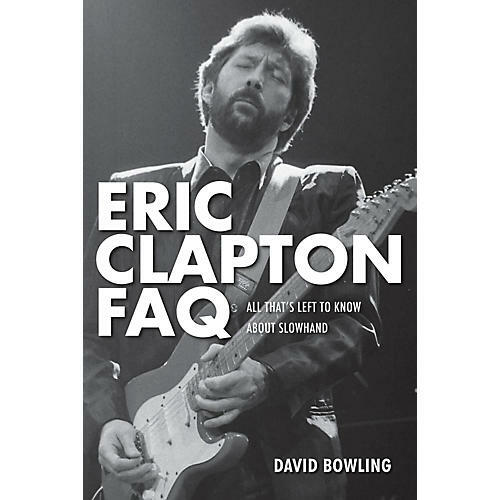 Eric Clapton FAQ combines the obvious, the well-known, the obscure, and the unknown into one place. It was not written as a definitive Clapton biography or a tell-all book that has the final say. It is, as the title suggests, a book of facts. Clapton is one of those public figures we know much about, but he still seems to be partially shrouded in mystery. Sometimes the stories and facts about his life change and evolve, which is all a part of his mystique. Eric Clapton FAQ uncovers some of that mystery and celebrates his talent in an entertaining style. Packed with dozens of rare images, this book is must for Slowhand fans.